Hello to all the lovers and those that are loved. Valentine’s Day is upon us once again and love is certainly in the air! 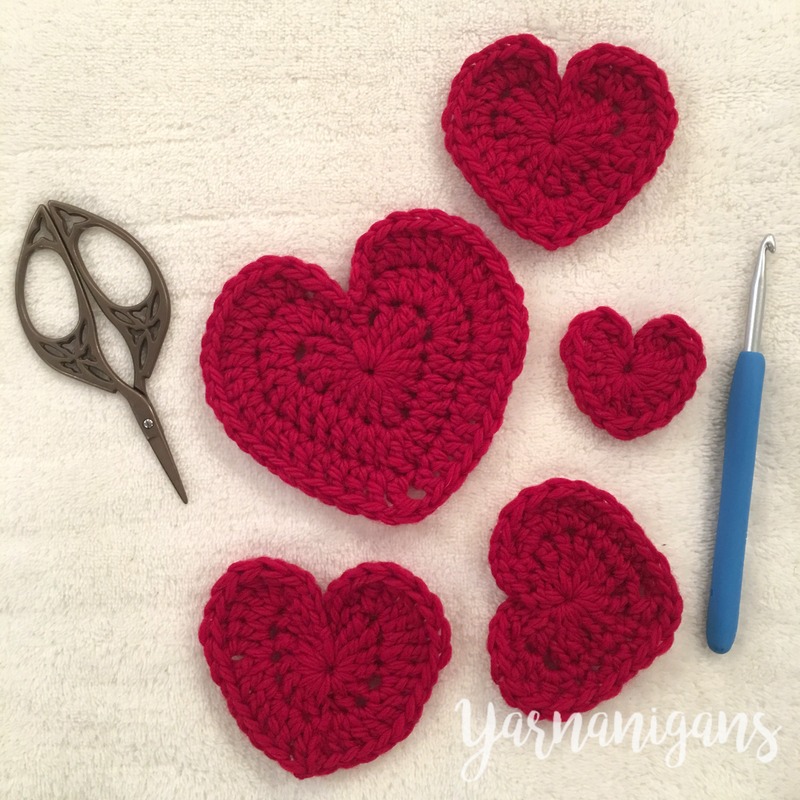 A super quick and easy pattern to make and pass out to your loved ones is most certainly a crochet heart! With just a little bit of yarn and a hook, you can show someone just how much you appreciate them and provide them a material reminder of your love and caring. I wanted to extend beyond just the standard crochet heart and make them more “warm and fuzzy” to truly represent those warm and fuzzy feelings I have for my loved ones. That is why I chose to crochet mine with wool and felt them. I had never felted anything before, but with a little research I’ve come to find it’s pretty simple. If people can felt sweaters by accident then surely I can felt something on purpose! 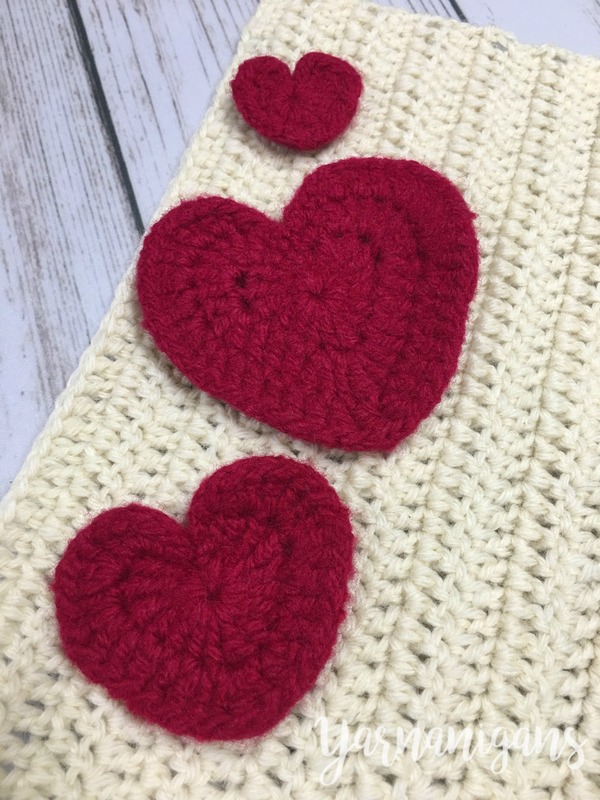 Here is the easy peasy pattern for crocheting three different size crochet hearts. All my patterns are available for free. Please do not copy, sell, redistribute or publish this pattern as your own. If you wish to share this pattern on your site or social media, please link back to my site. You may sell items produced using this pattern provided you give credit and do not use my copyrighted photos for your product listing. small amount of red wool yarn (pure not superwashed), chunky or worsted weight. I used Cascade Yarns Eco+ 100% Peruvian Highland wool in 8450 Scarlet. Patons Classic Wool or Classic Wool Roving are highly recommended substitutes. In the first round for all heart sizes, you’ll be working in the very first chain of the beginning ch 4, meaning the furthest chain from the hook. Each and every stitch of the round will be worked in that chain stitch. Create a slip knot, insert hook and Ch 4. In last ch from the hook, 3 tr. (All stitches will be worked in this ch st). Continue working in the same ch st, 4 dc, 1 tr, 4 dc, 3 tr. Ch 3 then sl st in the same ch st as previous stitches. Follow instructions for the small heart through Step 2. This completes Rnd 1. Rnd 2: 2 sc in ch sp from first rnd. In 1st tr st from Rnd 1, 3 dc. 3 dc in next st. 3 dc in next st. Dc 1 in each of the next 3 st. 2 dc in next st. (Dc 1, tr 1, dc 1) in next st. 2 dc in next st. Dc 1 in each of the next 3 st. 3 dc in each of the next 3 st. 2 sc in ch3 sp from previous Rnd. Sl st in center. Complete Steps 1 and 2 from small heart pattern and step 2 from medium heart pattern. Rnd 3: Sc in 1st sc from previous rnd. Sc in next 2 st. 2 dc in each of the next 8 st. Dc in each of the next 6 st. Ch 1, tr in next st, ch 1, dc in each of the next 6 st. 2 dc in each of the next 8 st. Sc in next 3 st. Sl st in center. The key to felting wool is to use very hot water to open up the fibers, then agitate them to cause the fibers to fluff up and stick to one another. Since this was my first time felting, it took a little trial and error to finally get the hang of it. Beware that felting wool will cause the size of the piece to shrink some. If your looking for an exact size, it’s best to swatch, measure, felt and measure again to calculate shrinkage. If not, just make your initial piece bigger than you intend and it will come out somewhere in the size ballpark you want. Place your crochet hearts in a mesh laundry bag that is loose and flexible. Using a large plastic tub, fill halfway with very hot water that is barely tolerable to your touch. Add about a teaspoon of dish washing soap or wool wash soap like Euculan or Soak. Submerge the bag into the water and swish back and forth gently to allow water to soak in. You will notice since we are using red yarn that the dye will bleed in the hot water. It should only bleed a small amount and not lose too much color. You will want to wear gloves for step 6 though if you don’t want to dye your hands pink. This will also allow the water to cool just enough to not scorch your hands. With the crocheted hearts still in the bag, sandwich them between your hands and begin rubbing them together somewhat vigorously. Do this for several minutes. The agitation of the bag against the crochet hearts is what you really need to get a thorough felted look. You don’t have to keep the hearts submerged as you agitate but make sure you re-wet and warm up the fibers by dunking them every minute or so. Remove the crochet heart from the bag and examine for thoroughness of the felting process. If it’s not to your liking, continue with step 6 and add additional hot water to keep the fibers open. One satisfied, rinse the crochet heart under cold water, then squeeze out any excess water first between your hands, then by pressing the heart between 2 towels. Set out to dry on another towel or throw in your dryer at the hottest heat for extra measure. Warm and Fuzzy Hearts to help spread the love! Felting wool for fun has so many possibilities for use. I’ll be using mine in this Pouch pattern/tutorial that is perfect for Valentine’s Day! Thanks so much for stopping by and have a yarntastic day!